The 2019 Travellers Series consists of 4 events with 3 to count, although we're looking to add further events in the autumn. The first open meeting of the year was held at Burghfield Sailing Club, and with a good forecast (so I’m told, I never look) 7 boats travelled from far and wide to join the 2 home boats. 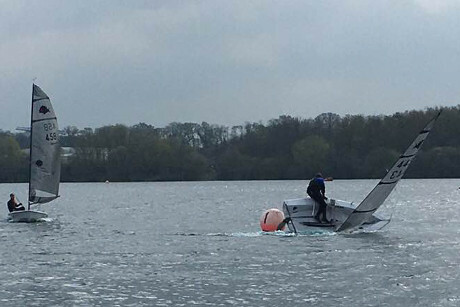 After a briefing and having the layout of the buoys explained, several times, we launched with a reasonable breeze. The first race got underway promptly and, with the wind increasing slightly throughout, this helped Jack Turnbull pop out of the pack to take the first win, followed by Josh Hamer who had made up places all through the race. The second race followed, this time with Josh getting away at the start never to be seen again. The rest of the fleet were battling hard and on the final downwind leg, Paul Nix managed to sail underneath Martin Tubb, Peter Blackman and Jack to take second place. 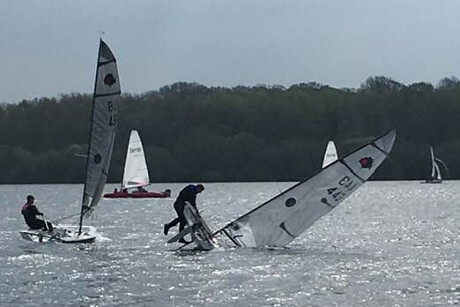 Although Peter did slightly hamper himself with a perfectly positioned capsize at the gybe mark… right in front of the clubhouse. After a hearty lunch, the racing continued in earnest following a similar tale to the second race. This time though it was Peter keeping Josh company as the pair battled out front, despite any local knowledge this wasn’t to stop momentum that was building for Josh. 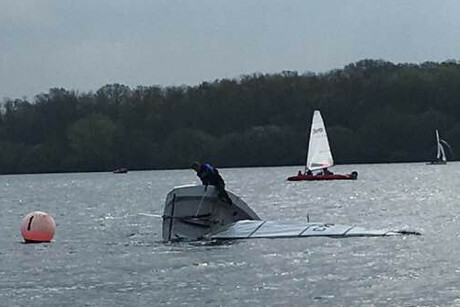 Meanwhile back in the fleet Paul succumbed and joined Peter in the capsize club, although he did show his experience and picked a better place with no cameras around. The 4th and final race of the day saw Kevin wake up as he and Josh lead round the first beat. The downwind leg saw Josh stretch his legs and pull away, the following windward leg Jack caught Kevin where they went different ways round the top island with Kevin coming out still ahead. Under no pressure, Josh made it a hat trick of victories for the day. Sunday dawned with less breeze than Saturday but just as much enthusiasm; a course was set, a race officer found and we were off. As the race progressed it appeared the lighter wind was suiting Peter Blackman as he lead the field for the majority of the race, right up until the first and final run through the start/ finish gate when Josh made his move and pipped Peter over the line. The first open of the year has lived up to expectations and left a hard act for the rest of the year’s meetings to follow with extremely close racing throughout the field and only 2 points separating 2nd-4th, 0.5 point 5th-6th and 3 points separating 7th-9th.